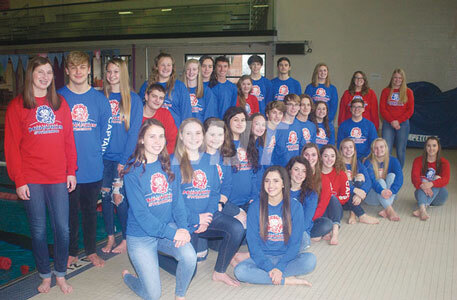 Members of the Marysville High School swimming program are from left, front row, Leah Hardy, Mikayla Seman, Emily Rodenhausen, Karlie Marlatt, Diana Jimenez, Morgan Grawe and Rachel Poling; second row, Emma Myers, Emma Menge, Abby Hemker, Remini Roush, Riley Sherick, Shane Hothem, Ethan Turk, Hank Luther, Emma Lowe and Jacob Markert; back row, Cori Lee, Aron Moledor, Sophie Taracko, Jacob Meyer, Margaret Hakola, Cassi Van Dyke, Maddie Irving, Adam Platt, Maddie Watts, David Bonczak, Kye Longbrake, Madelyn Murphy, Olivia Thallman and Jenny Larsen. The girls’ side of the Marysville High School swimming ledger will be strong during the 2018-19 season. On the other hand, the Monarch boys will still be in a rebuilding mode. “This year’s girls team will be the strongest team I have coached in the past six years, ” said Craig Faircloth. “We have two returning individual event team record holders in Rachel Poling (100 freestyle) and Morgan Grawe (100 butterfly) who are looking to improve on last year’s record-breaking swims. Diana Jimenez and Mikayla Seman joined Poling and Grawe to shatter the school’s 400 freestyle relay record last year. The quartet will be looking to break that relay record again and also have the potential to break additional records. Poling leads a strong list of returning lettermen. She will compete in the 50 and 100 freestyle, along with the 100 breastroke. -Remini Roush: 100 backstroke, 200 and 500 freestyle. With only nine athletes on the roster, the Monarch boys will have to endure another rebuilding campaign. Marysville’s boys lettermen are Aron Moledor, 100 breastroke, 200 IM; Ethan Turk: 100 butterfly, 50 and 100 freestyle; and Hank Luther, 100 breaststroke, 50 and 100 freestyle, 200 IM. -Riley Sherick: 50, 100 and 200 freestyle.